2 President Wilsons letter defining the border between Armenia and Turkey. Following WWI, the representatives of the newly born Armenian Republic and the Turkish Government negotiated the Treaty of Sevres. I have scanned in all the relevant materials regarding the border between Turkey and Armenia. [Click here for the full text of the Treaty of Sevres] This was the agreed upon border. There was a revolution in Turkey, which overthrew the government and invaded Armenia, after which the treaty of Sevres was not ratified or implemented. Instead a Treaty of Lausanne was signed, to which Armenia was not a signatory. Turkey, in accordance with the action already taken by the Allied Powers, hereby recognises Armenia as a free and independent State. Turkey and Armenia as well as the other High Contracting Parties agree to submit to the arbitration of the President of the United States of America the question of the frontier to be fixed between Turkey and Armenia in the Vilayets of Erzerum, Trebizond, Van and Bitlis, and to accept his decision thereupon, as well as any stipulations he may prescribe as to access for Armenia to the sea, and as to the demilitarisation of any portion of Turkish territory adjacent to the said frontier. The proportion and nature of the financial obligations of Turkey which Armenia will have to assume, or of the rights which will pass to her, on account of the transfer of the said territory will be determined in accordance with Articles 241 to 244. Part VIII (Financial Clauses) of the present Treaty. In the event of any portion of the territory referred to in Article 89 heing transferred to Armenia, a Boundary Commissionm whose composition will be determined subsequetly, will be constituted within three months from the delivery of the decision referred to in the said Article to trace on the spot the frontier between Armenia and Turkey as established by such decision. The frontiers between Armenia and Azerbaijan and Georgia respectively will be determined by direct agreement between the States concerned. If in either case the States concerned have failed to determine the frontier by agreement at the date of the decision referred to in Article 89, the frontier line in question will be determined by the Principal Allied Powers, who will also provide for its being traced on the spot. Armenia accepts and agrees to embody in a Treaty with the Principal Allied Powers such provisions as may be deemed necessary by these Powers to protect the interests of inhabitants of that State who differ from the majority of the population in race, language, or religion. Armenia further accepts and agrees to embody in a Treaty with the Principal Allied Powers such provisions as these Powers may deem necessary to protect freedom of transit and equitable treatment for the commerce of other nations. President Wilsons acceptance letter for drawing the frontier. By action of the Supreme Council taken on April 26th of this year an invitation was tendered to me to arbitrate the question of the boundaries between Turkey and the new state of Armenia. Representatives of the powers signatory on August 10th of this year to the Treaty of Sevres have acquiesced in conferring this honor upon me and have signified their intention of accepting the frontiers which are to be determined by my decision, as well as any stipulation which I may prescribe as to access for Armenia to the sea and any arrangement for the demilitarization of Turkish territory lying along the frontier thus established. According to the terms of the arbitral reference set forth in part III, Section 6, Article 89, of the Treaty of Sevres, the scope of the arbitral competence assigned to me is clearly limited to the determination of the frontiers of Turkey and Armenia in the Vilayets of Erzernm, Trebizond, Van and Bitlis. With full consciousness of the responsibility placed upon me by your request, I have approached this difficult task with eagerness to serve the best interests of the Armenian people as well as the remaining in habitants, of whatever race or religious belief they may be, in this stricken country, attempting to exercise also the strictest possible justice toward the populations, whether Turkish, Kurdish, Greek or Armenian, living in the adjacent areas. In approaching this problem it was obvious that the existing ethnic and religions distribution of the population in the four vilayets could not, as in other parts of the world, be regarded as the guiding element of the decision. The ethnic consideration, in the case of a population originally so complexly intermingled, is further beclouded by the terrible results of the massacres and deportations of the Armenians and Greeks, and by the dreadful losses also suffered by the moslem inhabitants through refugee movements and the scourge of typhus and other diseases. The limitation of the arbitral assignment to the four vilayets named in Article 89 of the Treaty made it seem a duty and an obligation that as large an area within these vilayets be granted to the Armenian state as could be done, while meeting the basic requirements of an adequate natural frontier and of geographic and economic unity for the new state. It was essential to keep in mind that the new state of Armenia, including as it will a large section of the former Armenian provinces of Transcaucasian Russia, will at the outset have a population about equally divided between Moslem and Christian elements and of diverse racial and tribal relationship. The citizenship of the Armenian Republic will, by the tests of language and religion, be composed of Turks, Kurds, Greeks, Kizilbashis, Lazes and others, as well as Armenians. The conflicting territorial desires of Armenians, Turks, Kurds and Greeks along the boundaries assigned to my arbitral decision could not always be harmonized. In such cases it was my belief that consideration of healthy economic life for the future state of Armenia should be decisive. where, however, the requirements of a correct geographic boundary permitted, all mountain and valley districts along the border which were predomi. nantly Kurdish or Turkish have been left to Turkey rather than assigned to Armenia, unless trade relations with definite market towns threw them necessarily into the Armenian state. Wherever informaion upon tribal relations and seasonal migrations was obtainable, the attempt was made to respect the integrity of tribal groupings and nomad pastoral move ments. From the Persian border southwest of the town of Kotur the boundary line of Armenia is determined by a rugged natural barrier of great height, extending south of Lake Van and lying southwest of the Armenian cities of flitlis and Mush. This boundary line leaves as a part of the Turkish state the entire Saudjak of Hakkiari, or about one-half of the Vilayet of Van, and almost the entire Sandjak of Sairt. The sound physiographic reason which seemed to justify this decision was further strengthened by the ethnographic consideration that Hakkiari and Said are predominently Kurdish in population and economic relations. It did not seem to the best interest of the Armenian state to include in it the upper valley of the Great Zab River, largely Kurdish and Nestorian Christian in population and an essential element of the great Tigris river irrigation system of Turkish Kurdistan and Mesopotamia. The control of these headwaters should be kept, wherever possible, within the domain of the two interested states, Turkey and Mesopotamia. For these reasons the Armenian claim upon the upper valley of tile Great Zab could not be satisfied. The boundary upon the west from Bitlis and Mush northward to the vicinity of Erzingan lies well within Bitlis and Erzerum vilayets. It follows a natural geographic barrier, which furnishes Armenia with per fect security and leaves to the Turkish state an area which is strongly Kurdish. Armenian villages and village nuclei in this section, such as Kighi and Temran, necessarily remain Turkish because of the strong commercial and church ties which connect them with Kliarput rather (than?) with any Armenian market and religious centers which lie within ilitlis or Erzermn vilayets. This decision seemed an unavoidable consequence of the inclusion of the city and district of Kharput in the Turkish state as determined by Article 27 11(4) and Article 89 of the Treaty of Sevrcs. From the northern border of the Dersim the nature and the direction of the frontier decision was primarily dependent upon the vital question of supplying an adequate access to the sea for the state of Armenia. Upon the correct solution of this problem depends, in my judgment, the future economic well-being of the entire population, Turkish, Kurdish, Greek, Armenian, or Yezidi, in those portions of the vilayets of Erzerum, Bitlis and Van which lie within the state of Armenia. I was not unmindful of the desire of the Pontie Greeks, submitted to me in a memorandum similar, no doubt, in argument and content to that presented to the Su preme Council last March at its London Conference, that the unity of the coastal area of the Black sea inhabited by them be preserved and that arrangement be made for an autonomous administration for the re gion stretching from Riza to a point west of Sinope. The arbitral juris diction assigned to me by Article 89 of the Treaty of Sevres does not in. elude the possibility of decision or recommendation by me upon the ques tion of their desire for independence, or failing that, for autonomy. Nor does it include the right to deal with the littoral of the independent Sandjak of Djanik or of the Vilayet of Kastamuni into which extends the region of the unity and autonomy desired by the Pontic Greeks. Three possible courses lay open to me: to so delimit the boundary that the whole of Trebizond Vilayet would lie within Turkey, to grant it in its entirety to Armenia, or to grant a part of it to Armenia and leave the remainder to Turkey. The majority of the population of Trebizond Vilayet is incontestably Moslem and the Armenian element, according to all pre-war estimates, was undeniably inferior numerically to the Greek portion of the Christian minority. Against a decision so clearly indicated on ethnographic grounds weighed heavily the future of Armenia. I could only regard the question in the light of the needs of a new political entity, Armenia, with mingled Moslem and Christian populations, rather than as a question of the future of the Armenians alone. It has been and is now increasingly my conviction that the arrangements providing for Armenia's access to the sea must be such as to offer every possibility for the development of this state as one capable of reassuming and maintain ing that useful role in the commerce of the world which its geographic position, athwart a great historic trade route, assigned to it in the past The civilization and the happiness of its mingled population will largely depend upon the building of railways and the increased accessibility of the hinterland of the three vilayets to European trade and cultural influ ences. Eastward from the port of Trebizond along die coast of Lazistan no adequate harbor facilities are to be found and the rugged character of the Pontic range separating Lazistan Sandjak from the Vilayet of Erzerum is such as to isolate the hinterland from the coast so far as practicable railway construction is concerned. The existing caravan route from Persia across the plains of Hayazid and Erzcrum, which passes through the towns of Baiburt and Gumush-khana and debouches upon the Black Sea at Trebizond, has behind it a long record of persistent usefulness. These were the considerations which have forced me to revert to my original conviction that the town and harbor of Trebizond must become an integral part of Armenia. Because of the still greater adaptability of the route of the Karshut valley, ending at the town of Tireboli, for suc cessful railway construction and operation I have deemed also essential to include this valley in Armenia, with enough territory lying west of it to insure its adequate protection. I am not unaware that the leaders of the Armenian delegations have expressed their willingness to renounce claim upon that portion of Trebizond Vilayet lying west of Surmena. Commendable as is their desire to avoid the assumption of authorhy over a territory so predominantly Moslem, I am confident that, in ac quiescing in their eagerness to do justice to the Turks and Greeks in Trebizond I should be doing an irreparable injury to the future of the land of Armenia and its entire population, of which they will be a part. It was upon such a basis, Mr. President, that the boundaries were so drawn as to follow mountain ridges west of the city of Erzingan to the Pontic range and thence to the Black Sea, in such a way as to include in Armenia the indentation called Zephyr Bey. The decision to ]eave to Turkey the harbor towns and hinterland of Kerasun and Ordu in Trebizond Sandjak was dictated by the fact that the population of this region is strongly Moslem and Turkish and that these towns are the out lets for the easterumost sections of the Turkish vilayet of Sivas. The parts of Erzeium and Trebizond Vilayets which, by reason of this delimitation, remain Turkish rather than become Armenian comprise approximately 12,120 square kilometers. In the matter of demilitarization of Turkish territory adjacent to the Armenian border as it has been broadly described above, it seemed both impracticable and unnecessary to establish a demilitarized zone which would require elaborate prescriptions and complex agencies for their execution. Fortunately, Article 177 of the Treaty of Sevres prescribes the disarming of all existing forts throughout Turkey. Articles 159 and 196-200 provide in addition agencies entirely adequate to meet all the dangers of disorder which may arise along the borders, the former by the requirement that a proportion of the officers of the gendarmerie shall be supplied by the various Allied or neutral Powers, the latter by the estab lishment of a Military Inter-Allied Commission of Control and Organi zation. In these circumstances the only additional prescriptions which seemed necessary and advisable were that the Military Inter-Allied Commission of Control and Organization should, in conformity with the powers bestowed upon it by Article 200 of the Treaty, select the superior officers of the gendarmerie to be stationed in the vilayets of Turkey lying contiguous to the frontiers of Armenia solely from those officers who will be detailed by the Allied or neutral Powers in accordance with Article 159 of the Treaty; and that these officers, under the supervision of the Military Inter-Mijed Commission of Organization and Control, should be especially charged with the duty of preventing military preparations directed against the Armenian frontier. It is my confident expectation that the Armenian refugees and their leaders, in the period of their return into the territory thus assigned to them, will by refraining from any and all form of reprisals give to the world an example of that high moral courage which must always be the foundation of national strength. The world expects of them that they give every encouragement and help within their power to those Turkish refugees who may desire to return to their former homes in the districts of Trebizond, Erzerum, Van and Bitlis remembering that these peoples, too, have suffered greatly. It is my further expectation that they will offer such considerate treatment to the Laz and the Greek inhabitants of the coastal region of the Black Sea, surpassing in the liberality of their administrative arrangements, if necessary, even the ample provisions for non-Armenian racial and religious groups embodied in the Minorities Treaty signed by them upon August 10th of this year, that these peoples will gladly and willingly work in completest harmony with the Armenians in laying firmly the foundation of the new Republic of Armenia. I have the honor to submit herewith the text of my decision. President Wilsons letter defining the border between Armenia and Turkey. Respecting the Frontier Betteen Turkey and Armenia, Access for Armenia to the Sea, and the Demilitarization of Turkish Territory Adjacent to the Armenian Frontier. 1. The initial point* shall be chosen on the ground at the junction of the Turkish-Persian frontier with the eastern termination of the administrative boundary between the Sandjaks of Van and Hakkiari, of the Vilayet of Van, as this administrative boundary appears upon the Bashkala sheet of the Turkish map, scale 1 :200,000, editions published in the Turkish financial years 1330 and 1331 (1914-15). From this initial point the boundary shall extend southwest- ward to the western peak of Merkezer Dagh, situated about 6 kilometers west ward from point 3350 (10,990 feet), about 2 kilometers southeastward from the village of Yokary Ahvalan, and approximately 76 kilometers southeastward from the city of Van. 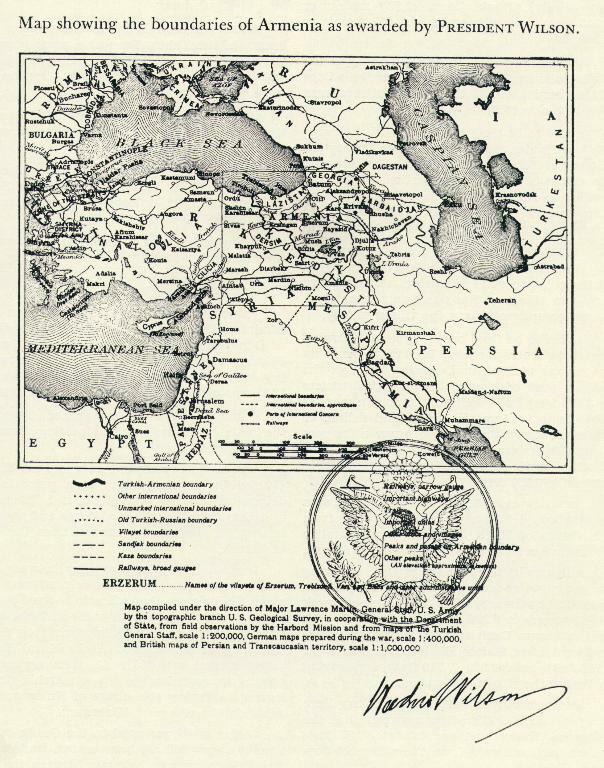 *It is my understanding that this initial point will lie upon the former Turkish-Persian frontier referred to in the Article 27 II (4) of the Treaty of Sevres; but 40 miles of the said frontier, within which the initial point of the Armenian frontier is included, were left undemarcated by the Turko-Persian Frontier Commission in 1914. The initial point contemplated lies about 1 kilometer southward from the village of Kara Hissa and approximately 25 kilo meters southwestward from the village of Kotur, and may be fixed on the ground as near this location as the Boundary Commission shall determine, provided it lies at the junction of the Van-Hakkiari Sandjak boundary with the frontier of Persia. Vilayet with the boundary of Dersim Sandjak of Mamuret-ul-Aziz Vilayet lies within 14 kilometers of the Euphrates River. This leaves to Turkey a military bridgehead north of an 11,000 foot mountain range and only 20 kilometers south of the city of Erzingan. I am not empowered to change the administrative boundary at this point, and these 40 square kilometers of territory lie outside the four vilayets specifid in Article 89 of the Treaty of Sevres. However, I venture to call the attention of the Boundary Commission to the desirability of consulting the local inhabitants with a view to possible modification of the vilayet boundary at this point. a line to be fixed on the ground, following the main water-partings, leaving to Turkey the fields, pastures, forests, and villages within the drainage basin of the Komit Dere (Ak Su) and its tributaries; and to Armenia the fields, pastures, forest, and villages within the drainage basins of the Yaghaj Dere (Espiya Dere) and the Venazit Dere (Keshab Dere) and their tributaries, and drawn in such a manner as to utilize the boundary between the Kazas of Tripoli (Tireboli) and Kerasun in the 7 kilometers just south of Kara Tepe (1,696 meters or 5,565 feet), and to provide the most convenient relationships between the new frontier and the trails along the ridges, as these relationships may be determined by the Boundary Commission in the field after consultation with the local inhabitants. 2. In case of any discrepancies between the text of this Decision and the maps on the scales of 1:1,000,000 and 1:200,000 annexed, the text will be final. The limits of the four vilayets specified in Article 89 of the Treaty of Sevres are taken as of October 29, 1914. The frontier, as described above, is drawn in red on an authenticated map on the scale of 1:1,000,000 which is annexed to the present Frontier Decision. The geographical names here mentioned appear upon the maps accompanying this text. The chief authorities used for the names of Geographical features, and of elevations of mountains, and the location of vilayet, sandjak, and kaza houndaries, are the Turkish General Staff map, scale 1:200,000, and, in part, the British map, scale 1:1,000,000. The maps on the scale of 1:200,000 are recommended to the Boundary Commission, provided in Article 91, for their use in tracing on tbe spot the portion of the frontiers of Armenia established by this Decision. The frontier described above, by assigning the harbor of Trebizond and the valley of Karshut Su to Armenia, precludes the necessity of further provision for access for Armenia to the sea. The Military Inter-Allied Commission of Control and Organization provided for in Articles 196-200 of the Treaty of Sevres shall appoint the superior officers of the gendarmerie stationed in those vilayets of Turkey lying contiguous to the frontiers of the state of Armenia exclusively from the officers to be supplied by the various Allied or neutral Powers according to Article 139 of the said Treaty. These officers shall, in addition to their other duties, be especially charged with the task of observing and reporting to the Military Inter-Allied Commission of Control and Organization upon any tendencies within these Turkish vilayets toward military aggression against the Armenian frontier, such as building strategic railways and highways, the establishment of depots of military supplies, the creation oC military colonies, and the use of propaganda dangerous to the peace and quiet of the adjacent Armenian territory. The Military Inter-Allied Commission of Control and Organization shall thereupon take such action as is necessary to prevent the concentrations and other aggressive activities enumerated above. Done in duplicate at the city of Washington on the twenty-second day of November, one thousand nine hundred and twenty, and of (SEAL) the Independence of the United States the one hundred and forty-fifth. This page was last edited on 15 October 2018, at 05:46.